The Rocky Point parking lot will be closed on Tuesday-Wednesday, April 16-17, for paving. Take a tour with a Park System historian and visit the exhibits to learn about Battery Lewis and the site’s past, from Hartshorne estate to military base, to the creation of Hartshorne Woods Park. Battery Lewis will be open from Memorial Day Weekend through Columbus Day Weekend in 2019. Please check back in May for this year’s tour schedule. A hilly, forested 794-acre site overlooking the Navesink River, this park is among the highest elevations along the Atlantic Coast and features prominently in area history as a former coastal defense site. Known for its challenging trail system and scenic views, Hartshorne Woods is a popular park for area hikers, bicyclists and outdoor enthusiasts. Park features: group cabin camping (by reservation), cross country ski trails, fishing in the Navesink River and trails for walking, hiking, biking, and horseback riding. It's the perfect place to escape the sounds of suburbia. Please be aware that NJ anglers age 16 and up are now required to register with the NJ Saltwater Angler Registry (for free) to fish in marine and fresh tidal waters of NJ. For more information regarding the registration, click here. Please note that there is an ongoing archaeological investigation at the Claypit Creek section of the park and that metal detecting activity is not permitted there. This park is named after Richard Hartshorne an English Quaker from London who settled here in 1669 and acquired more than 2,300 acres of land. By the early 1880s, some of the land was sold to private individuals and the U.S. government, but large portions remained in Hartshorne family ownership. The Park System acquired the first 660 acres of this park in 1974. Additional land was conveyed from the government in 1984, and subsequent purchases – including the 44-acre Claypit Creek section in 2005- brought the park to its current size. The Hartshorne property was a desirable defense site because of its high elevation. Through the years, it hosted a number of different land and air-based military installations to defend New York Harbor and surrounding areas. During the WWII era, batteries for heavy artillery were built on this site to modernize coastal defense efforts. 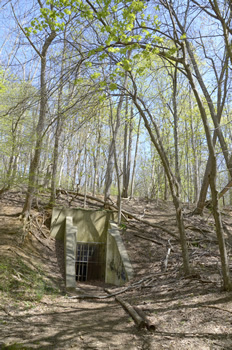 These concrete and earth encasements or bunkers – considered “bomb-proof” at the time – protected personnel and equipment. These structures can still be viewed today. With the rise of strategic air power and nuclear weapons, the reliance on artillery guns for coastal defense ended. 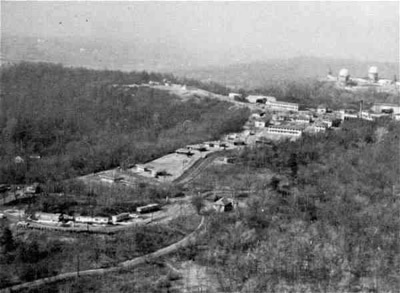 During the Cold War Era, from the 1950s-1970s, the site served as a missile defense site and command center with radar, computers and electronic plotting devices. Structures from this era have all been removed. The Park System recently completed a four-year restoration of Battery Lewis that included work on the two casemate canopies and wing walls; repairs to the interior concrete walls and historic steel doors; new steel gates, electrical service and lighting; and the addition of a 16-inch gun barrel and the interpretive exhibit. During the restoration, the 224-acre Navesink Military Reservation Historic District was listed on the National Register of Historic Places. Battery Lewis will be open from Memorial Day Weekend through Columbus Day Weekend in 2019. Please check back in May for this year’s tour schedule. 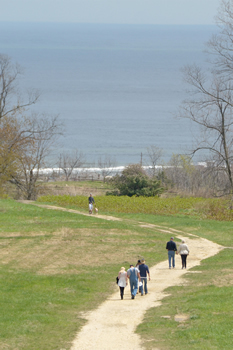 Read Discover History in the Parks Series: Navesink Military Reservation Hartshorne Woods Park (pdf) for more about the history of this site. A historic World War II naval gun from the Battleship New Jersey is on permanent display as part of the Battery Lewis restoration. The gun barrel, which is 68 feet long and weighs 120 tons, is almost identical to the 16-inch guns on Battery Lewis during World War II. 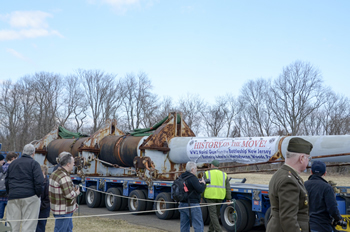 Donated by the U.S. Navy, the gun barrel traveled by rail from Norfolk, Virginia to Red Bank and then by truck to Hartshorne Woods Park. Visit our Facebook page to see photos of the delivery. 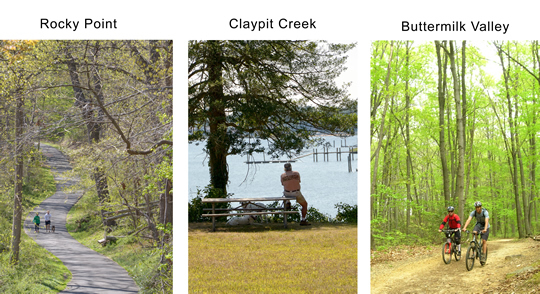 Hartshorne Woods Park has the most extensive and challenging series of trails (over 14 miles) in the Park System. Hardy hikers, bicyclists, and casual walkers can all find trails to their liking. Please stay on marked trails, plan your route, take a trail map, and wear appropriate safety gear. Enter from Navesink Ave., Locust or Portland Rd., Highlands. State Hwy. 35 to Navesink River Road and continue 4.7 miles. Turn right onto Locust Road. Cross Clay Pit Creek bridge to five way intersection. Bear right onto Navesink Ave and continue to Park. State Hwy 36 to Navesink Ave. Southbound turn right, northbound use jughandle for Locust/Navesink Ave. Cross Hwy and follow to park entrance on left. State Hwy 36 east towards Highlands Bridge. Turn right onto Portland Road before bridge. Follow to park. Traveling west, cross bridge and make 1st right. Travel downhill & under bridge to 1st right (Hillside Ave.). Up to Portland Road, turn left. Follow to park. Garden State Parkway to Exit 109. Southbound, turn left onto Rt. 520. Take jughandle for Half Mile Rd; northbound, go straight at exit. Follow Half Mile Rd. to end. Turn right at traffic light onto East Front St. Follow East Front St. to Hubbard Ave. Turn left onto Hubbard Ave. and follow (.6 mile) to Navesink River Rd. Turn right onto Navesink River Rd.and continue as it turns into Locust Pointe Road. Turn right onto Locust Ave. Entrance on the right. State Hwy. 35 to Navesink River Rd. (north of Cooper Avenue Bridge, Red Bank.) Northbound, turn right. Southbound, use jughandle to make left turn. Travel east and continue as it turns into Locust Pointe Road. Turn right onto Locust Ave. Entrance on the right.